As animal welfare groups around the world eagerly await India's Supreme Court verdict on the petition for captive elephants filed by Wildlife Rescue and Rehabilitation Center (WRRC), Ms. Suparna Baksi Ganguly, (SG) the Hon. President of WRRC weighs in on the future of India's heritage animal. 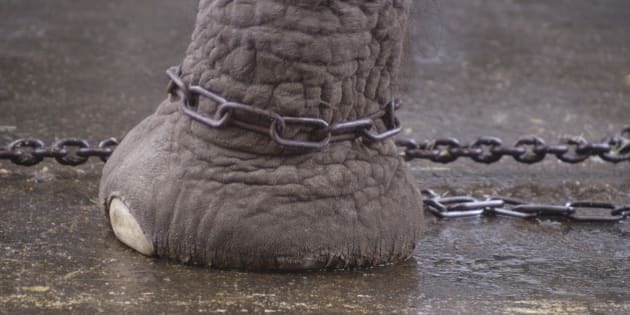 Closeup of a circus elephant's (elephantus) chained foot. As animal welfare groups around the world eagerly await India's Supreme Court verdict on the petition for captive elephants filed by Wildlife Rescue and Rehabilitation Center (WRRC), Ms. Suparna Baksi Ganguly, (SG) the Hon. President of WRRC weighs in on the future of India's heritage animal, and the precarious situation of Kerala's elephants. She is cautiously optimistic about the outcome, and calls on the government, animal welfare groups and the public to work collectively in order to provide adequate welfare for India's cultural icon. SI: Please provide an overall status of the SC case as it stands now. SG: As it stands now, the hearing on 21st September has been adjourned to Oct. 21, 2016. The Solicitor General requested that the matter be listed for final hearing. In the interim, the Court has directed no other Interlocutory Applications will be filed. SI: What outcome do you expect? SG: I expect that the Supreme Court will look into the prayers of the main petition which are wide ranging and focus on cruelties and abuse, ownership issues, rescue centers, employment of elephants in improper activities and stringent application of the Laws on all captive elephants in India as Schedule1 wildlife. SI: Do you think evidence provided by Gods in Shackles documentary would have made any impact? SG: Definitely. The film's impact has jarred the "cultural" sensibilities of the common public in Kerala. The visual shots from the film have also been submitted to the Court. Sadly, SC does not allow videos or film screenings but the volume of data submitted with large color photos of atrocities has made an impact, judging by the Interim Orders so far that have been directed by the Hon'ble Justice Dipak Mishra to all the States in India. SI: If they ban use of elephants how long do you think it would take for states to implement? SG: I cannot imagine that the States would rush to execute such an Order, so it may be conditional at one level and unconditional on another. We cannot really anticipate either the Final Order or the process of implementation but at least the states have formed the Captive Elephant Welfare Committees where there is scope for complaints to be redressed. SI: If they ban use of elephants in circuses, or festivals, is there an alternate plan for the 4,000 captive elephants in India? SG: We have made a prayer for the States to form Elephant Rescue Centers on Govt. land and with State and Central budget allocation. The detailing of that will be left to the individual Governments to take up. In my opinion, there will be certain amount of uncertainty faced by the custodians and users of such animals and the first generation of elephants post such an order, may face hardship. In the long run, it would have a very beneficial effect. The trade lines would be severed and the vast amounts of cash and black money and animal suffering that happen in procuring elephants for temples and private owners would have to be inevitably phased out. If demand drops and elephant displays have no value, then supply would also be affected in the true style of market economics! SI: Who will take care of them, Government or animal welfare groups? SG: The Government, since they have a permanency that an NGO would find it difficult to replicate. When we talk of elephants we talk easily of a commitment that can range up to 70 years. At the outer limit. It is good if the government collaborates with committed individuals and NGOs to share the burden of this massive, mammoth task. SI: Where will they be released? Is there enough space for them? SG: Rarely, can they be released! Most suffer from unique diseases, deformities, chronic infections and inability to adapt to the wild. In fact, they may also communicate diseases to the wild elephants. Hence their first entry should be to a space where there is proper sheltering and veterinary care and then reviewed periodically over the years. Also India's forest covers are shrinking and corridors and passages essential for elephants to survive are disappearing at an alarming rate. Wherever such elephants are released, they would be blamed for escalating human elephant conflicts and possibly be killed since they have no fear of humans and would readily approach villages for food, if hungry. SI: The problem is unique for Kerala as all of them are bull elephants and they are solitary animals. How can this be handled? SG: It is a horrid, unnatural situation. In the wild, mature tuskers do not even occupy the same spaces... In Kerala, such elephants are tied and made to rub shoulders with each other! The deep invisible stress that they go through is probably unimaginable to humans because they have these animals under control through the most heinous methods. One would need vast spaces to house them and that too would be a travesty because it would be a minuscule of what male elephants require to roam and forage and for their mental and physical health. That is why I feel that the first generation of such elephants would suffer in some ways but at least the future generations would be saved from such regressive practices. SI: What do you think needs to be done? SG: It really depends on the directions that the Supreme Court gives on this issue. There is no certainty that the prayers will be granted as we have envisioned. In such a case, we will need to rework strategies. The only important thing is to grant some critical relief for these suffering elephants all over the country. SI: There are many animal welfare groups operating in silos, and yet knowledge and resource sharing is important, what's your take on this? SG: It is extremely important that all animal welfare groups work in close harmony and if this does not happen, we would not be doing the right thing for the elephants. The problems are vast, the elephants needing help are many and people and organizations need to mature and develop to assist the Governments to take on this task.